These No Bake Cookie Dough Brownies features a incredibly fudgy and chocolatey brownie layer paired with a mouthwatering edible cookie dough studded with chocolate chips. Vegan, Paleo & Gluten Free. Friends, they’re finally here! 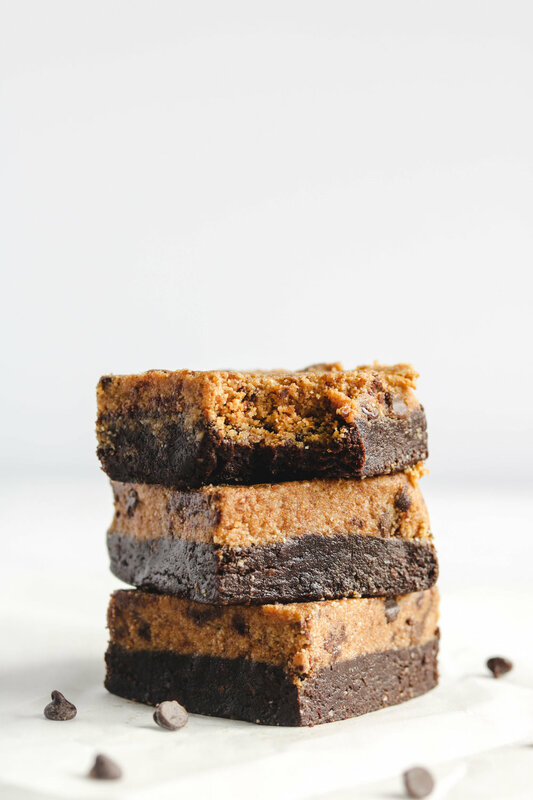 I have been so excited to share this recipe for these No Bake Cookie Dough Brownies! These are by far one of my favourite sweet treats I’ve shared here on the blog. Probably because they feature two of my favourite sweets: cookies and brownies! It’s a great day when you can eat BOTH at the same time. I know, lot’s of almond & coconut based stuff but trust me, it’s not coconut-y at all! I’ve also used fine oat flour which works perfectly fine too (I’ve written how to substitute the coconut flour for oat flour below). I personally was never a fan and don’t do too many “no bake” recipes, but this recipe has changed that for me. I’m convinced about no bake recipes- they can be amazing. What’s awesome about no bake recipes? Well first, you don’t need to turn on the oven! Perfect for the hotter weather coming up, turning on the oven is the last thing I want to do when its super hot in the kitchen already. No bake recipes are also so convenient because you don’t have to worry about checking constantly to see if it’s fully baked or making sure it doesn’t burn. Whats your favourite no bake recipe to make? I’d love to try them out! I do not recommend substituting the almond flour for any other flour. However, the oat flour can be substituted for coconut flour to keep it grain free: Use 1.5-2 tbsp of coconut flour in place of the oat flour. To substitute the coconut flour, use 3 tbsp of oat flour. If you recreate these No Bake Cookie Dough Brownies please share it and let me know what you think by tagging me on Instagram @lisakitahara, I love seeing all of your tasty recreations! 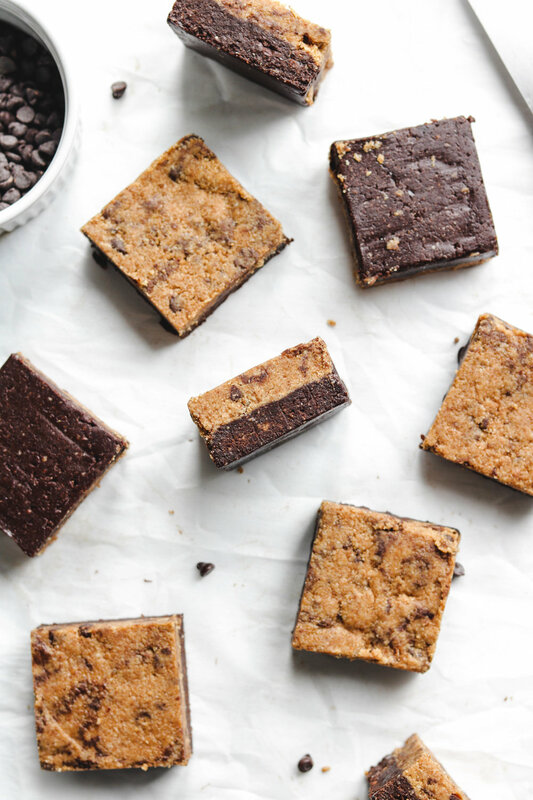 These No Bake Cookie Dough Brownies features a incredibly fudgy and chocolatey brownie paired with a mouthwatering edible cookie dough studded with chocolate chips. Vegan, Paleo & Gluten Free. Line a 6x6 inch baking tray with parchament paper. For the brownie layer: into a food processor add in the dates, chocolate almond butter and lesser amount of coconut flour and process until incorporated and a dough like mixture forms. If the dough seems too sticky or wet, add in the extra tbsp of coconut flour little by little. Press that into the lined baking pan evenly. Place that into the freezer while making the cookie dough layer. Add in the melted coconut butter and warmed almond butter into a medium sized bowl and stir to combine. Then add in the almond flour, coconut flour and coconut sugar. Mix until a sandy like mixture forms. You may need to use your hands in this step to incorporate well. Add in the chocolate chips and give it one last mix. Take the pan out of the freezer, then spread the cookie dough mixture evenly. Press the cookie dough layer down into the brownie layer as evenly and flat as possible. A flat potato masher OR a measure cup with a flat surface can be used to help achieve a flat top. Place into the freezer for 15 minutes or in the fridge for 30 minutes. Once out of the fridge, slice into 9 even squares and enjoy! ** substitute 1/4 cup fine oat flour for coconut flour in the brownie and 2 tbsp of fine oat flour for coconut flour in the cookie dough. Store these No Bake Cookie Dough Brownies in the fridge for up to 10 days and in the freezer for up to 2 months in an air tight container. If in the freezer, thaw for 2-3 minutes before eating.